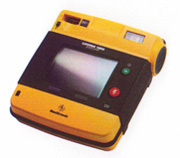 The LIFEPAK CR Plus AED is your complete solution for any AED program that is looking for a device that is simple to use and simple to maintain. 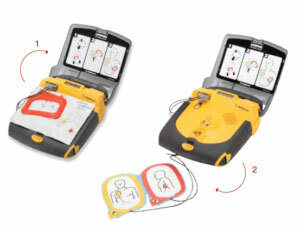 The Benefit of Fully Automatic – The Benefit of Fully Automatic- The fully automatic LIFEPAK CR PLUS AED can be used with just two simple steps: turn on the device and apply the electrode pads to the victim. The CR Plus then takes over, giving ClearVoicetm prompts and delivering the shock without anyone pushing a button. A recent study shows that safety is not compromised when untrained rescuers use the fully automatic AED. 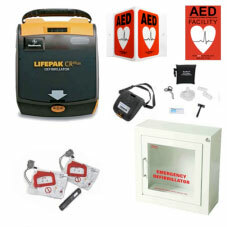 Device Includes: 2 pair QUIK-PAK pacing/defibrillation/ECG electrodes with REDI-PAK™ preconnect system CHARGE-PAK™, Charging Unit Quick reference instruction card, Carrying case, Ambu® Res-Cue Mask, AED program implementation starter kit Reference manual (CD), Orientation DVD 8 Year Warranty. Device Includes: 2 pair QUIK-PAK pacing/defibrillation/ECG electrodes with REDI-PAK™ preconnect system, CHARGE-PAK™ Charging Unit, Quick reference instruction card, Carrying case, Ambu® Res-Cue Mask Kit, AED program implementation starter kit Reference manual (CD), Orientation DVD, 8 Year Warranty. 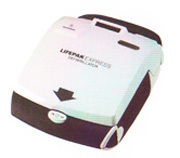 If you are looking for an AED that can be used in extreme or loud environments such as a manufacturing floor or oil rig, the LIFEPAK 1000 AED can meet your needs. The 1000 is also perfect for those who may update response protocols often, as the device gives you the flexibility to change simply and quickly.